Start your route in Washington, MO (which is about 50 miles west of downtown St. Louis). From Washington, MO its easy to describe as all you do is go west on Missouri Route 100 all the way to Linn Missouri (just follow the signs and enjoy the awesome scenery). Between Washington and Linn you'll pass through New Haven, Hermann, Gasconade, and Chamois. 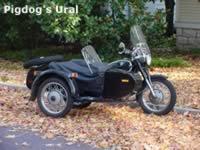 Special note from the submitter: For an excellent fall foliage ride, I like to go West on 100 to Linn. I then take Hwy 50 to Jefferson City. Cross the river and then go East on Hwy 94. You'll end up back where you started from. Ride through Missouri's rolling farmland and small country towns along the south side of the Missouri River. Missouri has never been great on road quality (i.e. bumps potholes), however, this route has lots of sweeping turns and hills to offer. Lot's of small towns to shop in. Hermann is in the middle of Missouri's wine country. Camping is available in Hermann also. The western end of the route is just a few miles from the state capital. on March 13, 2012 0 out of 0 members found this review useful. I agree with the submitter about the "side note" for Fall foliage route - take 100 out to Linn then return on 94 (for a different aspect).